My older brother always told me he was going to become a professional gamer. Now, he’s an electrician which is a pretty good job. But there are others that did fulfill that dream and play games all day and make money. Syndicate is really Tom Cassell a man in his 20’s who already lays claim to the title “millionaire”. Starting as a hobby, he slowly grew a following on YouTube. People watch as he plays their favorite games such as Halo, Modern Warfare 2, and Call of Duty: Black Ops Zombies. Before rising to fame Syndicate was a normal teenage boy. He went to school, worked at McDonald’s, and loved to play video games. But, he used the money from Mcdonalds to get the equipment to record his playing of video games, which lead to his success. It also led to him leaving high school as he was already making enough money, as well as working a job he wanted to work. Can You Really Make Money Playing Video Games? Syndicate’s net worth grows the better he becomes at games. The better he is the more interested people are in watching him. Being good at gaming is one side of the coin, however. He had to grow an audience. With nearly 10 million YouTube subscribers Syndicate can now put a video out and have it go viral the same day. Growing his following took hard work and time. He had to reach out to brands in order to sponsor him, as well as strive to have people share his videos. Syndicate’s net worth is $4.72 Million, not bad for someone who “just” plays video games. How did he make that money? Through the ads on YouTube for one. With so many views on each video he puts out he can easily make money that way. Sponsorships on top of the ads only increase his income. In addition, he has also started a clothes line where he sells shirts, phone cases, etc. with his logo on it. Can We Learn From A Gamer? Many use video games as a way to relax. Some of us don’t play video games at all, so what can we learn from someone who does it for a living? 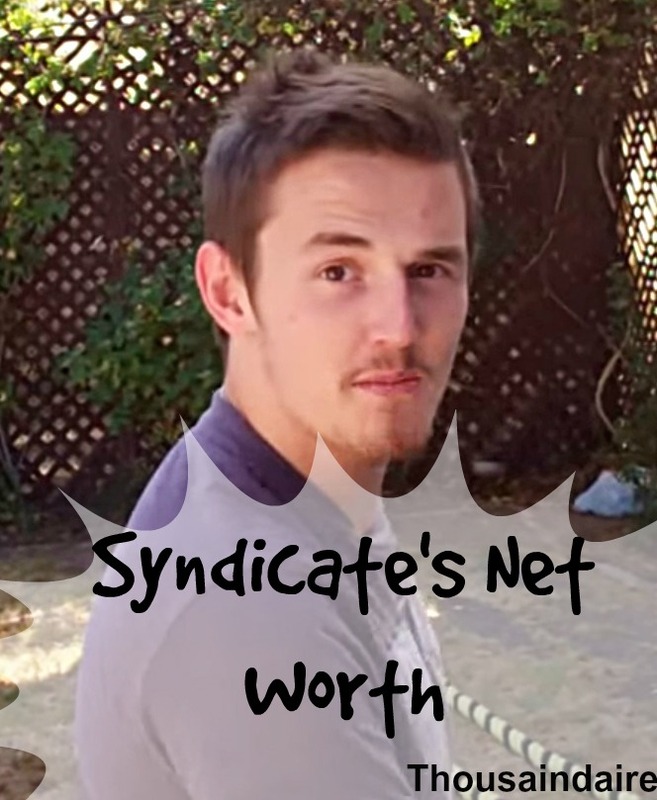 Syndicate’s net worth grew the better he got at playing his games. Our net worth can grow the better we get at our work. If we focus, learn all we can, make changes when needed then we’ll get a raise, promotion, or if we run our own business more sales. Syndicate also worked at funding sponsors, basically asking for money to do something he thought of as fun. It isn’t easy to ask people for money but he made those calls and convinced people to pay him. Sometimes we need to take chances, make difficult phone calls or even talk to people in person. Let yourself out of your comfort zone and you can have huge results. Syndicate found what he wanted to do with his life and didn’t let anyone get in his way. He quit school, left his job and didn’t look back. Sometimes we need to “burn the bridge” and focus on what we can do in the future never looking back. Maybe that’s leaving your 9 to 5 and only working on your business, or maybe it’s switching to a different company. These net worth looks are so cool. That’s nuts that you can make that much money playing video games – but I guess it goes to show you can monetize just about anything with the right angle.